After scoring 140 points in three of their last five games, can the Warriors continue their torrid streak against the Clippers on Friday night at Staples Center? The return of DeMarcus Cousins should help. The Golden State Warriors head to Staples Center in Los Angeles for a Friday night showdown with the Clippers having won six straight (3-2-1 against the spread) to propel themselves to the top of the Western Conference. The Warriors opened as 6-point favorites vs. Los Angeles and were bet up to -7 in early wagering action, per Las Vegas betting lines. But can the Warriors keep up their ridiculous scoring, which has seen them top 142 points in three of the last five games, and 122 in five of the last seven? A 51-point quarter? Madness. Even with oddsmakers hanging huge totals -- including 242 for Wednesday's game against the Pelicans -- Golden State has gone OVER four in a row and in seven of its last eight games. The Dubs are also 3-1-1 ATS in their last five. 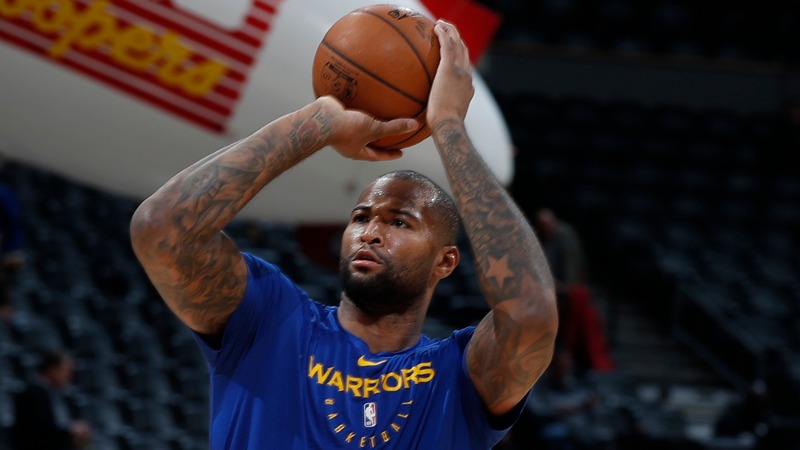 __MORE:__ [Oddsmakers are keeping pace with increased scoring in NBA](https://www.betchicago.com/nba-scoring-increase-oddsmakers-keeping-pace) And now, just in time for their matchup with the second-best team in the Pacific Division, the Warriors get DeMarcus Cousins [back into the fold](http://www.espn.com/nba/story/_/id/25626647/warriors-worried-demarcus-cousins-fit-lift-back-greatness). The rich get richer by one All-Star. The Clippers, meanwhile, are sliding the other way, having lost four straight both straight up and ATS. ### Warriors at Clippers odds, lines, trends 9:35 p.m. CT on NBCSCH __Point spread:__ Warriors -6 __Total:__ 241.5 __Moneyline:__ Warriors -300, Clippers +240 __Betting trends:__ &bull; OVER is 6-0 in Warriors last 6 vs. Western Conference. &bull; Warriors are 1-6 ATS in their last 7 vs. NBA Pacific. &bull; Warriors are 5-1 ATS in their last 6 Friday games. &bull; OVER is 7-0 in Clippers last 7 home games vs. a team with a winning road record. &bull; Clippers are 17-4 ATS in their last 21 Friday games. &bull; Clippers are 1-4 ATS in their last 5 games vs. a team with a winning straight up record. ## NBA betting lines, tips for Thursday, January 17 *Odds from Westgate LV SuperBook; All times Central ### Magic vs. Nets odds, lines, trends 6:05 p.m. __Point spread:__ Nets -1 __Total:__ 216.5 __Moneyline:__ Magic -110, Nets -110 __Betting note:__ Nets are 6-2 ATS in last eight, while Magic are just 2-5 in last seven. ### Celtics vs. Grizzlies odds, lines, trends 6:05 p.m. __Point spread:__ Celtics -10.5 __Total:__ 205.5 __Moneyline:__ Celtics -750, Grizzlies +525 __Betting note:__ Grizzlies are a woeful 3-17 in their last 20 ATS. ### Pistons vs. Heat odds, lines, trends 6:05 p.m. __Point spread:__ Pistons -2 __Total:__ 207.5 __Moneyline:__ N/A __Betting note:__ Pistons have won three straight ATS after losing four straight. ### Timberwolves vs. Spurs odds, lines, trends 7:05 p.m. __Point spread:__ Timberwolves -1 __Total:__ 224.5 __Moneyline:__ Timberwolves -125, Spurs +105 __Betting note:__ After a 13-3 stretch ATS, the Spurs are just 2-3 in their last five ATS. ### Jazz vs. Cavaliers odds, lines, trends 8:05 p.m. __Point spread:__ Jazz -15 __Total:__ 214.5 __Moneyline:__ Jazz -3500, Cavaliers +1300 __Betting note:__ Cavaliers have gone OVER in six of their last seven games. ### Trail Blazers vs. Pelicans odds, lines, trends 9:35 p.m. __Point spread:__ Trail Blazers -3 __Total:__ 233.5 __Moneyline:__ Trail Blazers -140, Pelicans +120 __Betting note:__ Portland is 7-3 ATS in the last 10. *Trends [via](https://www.covers.com/) Covers.com* __Play and win:__ Free [Daily NBA Pick 5 contest](https://betchicago.chalkline.com/games/nba-pick-5). Correctly pick five games against the spread to win a BetChicago prize pack.